What is the best way to research an architecture program? Most would suggest you visit the campus and meet with faculty/representatives from the architecture program. But many students may not have the resources nor time to visit. Well, attending an Architecture/Design Career Day/College Fair (see below) is the next best method to learn the details of an architecture program. 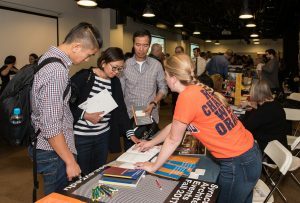 While many high schools and community colleges host annual college fairs, these events do not focus on architecture programs. Fortunately, there are a few annual events that are specifically for students interested in architecture. Even if you do not live in the immediate area, the investment in time and travel are well worth the cost as you can visit many programs at the same time. Held in the fall, these architecture Career Days/College Fairs are a great opportunity for you to learn more about pursuing an architecture degree. You can interact with representatives from different programs and ask specific questions (see examples below); you will connect with faculty, program administrators, and possibly students and alumni. Having these conversations will help you gain a better insight and help make a decision about which program is right for you. At these events you will have a chance to meet with many programs, allowing you to maximize your engagement in just a single day. And, in addition to meeting with program representatives, these events often provide workshops on topics such as selecting a school, career options, or financing your education, as well as portfolio reviews and guest speakers. Thus, kick start your research by attending one of the events in Boston, Philadelphia, Dallas, Chicago, or New York! What degree(s)/major(s) do you offer? What is special or unique about your program? What is the admission process? Is a portfolio required? What financial aid/scholarships are available? How does your school assist students with post-graduation plans? Do you have a graduate program? Does the program offer hands-on and/or workplace experience as part of the curriculum? What kind of professional experience does your faculty have? Are there opportunities for study abroad?